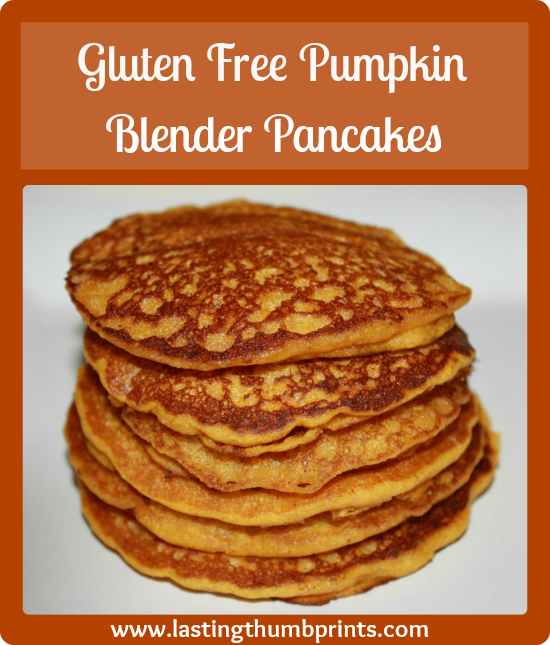 Gluten free pumpkin blender pancakes. Try saying that five times fast! So it may not roll off the tongue quickly, but y’all, these babies are good. This is a very easy gluten free recipe that’s loaded with sweet flavor. We thought they were moist and light, which is something that I haven’t been able to achieve when it comes to gluten free pancakes. I’m sure these would make an awesome non-gluten free pancake as well, but I haven’t tested that out yet. If you try it, let me know. 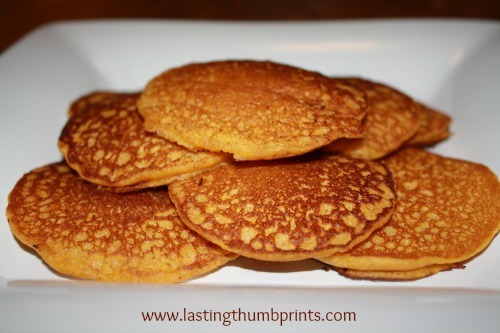 These pancakes were inspired by a recipe for leftover oatmeal pancakes I found over at The Peaceful Mom. (Thanks, Google!) You need to try that recipe, friends. Anyway, today I got a hankerin’ for some pumpkin pancakes, my mind starting churning, and a new autumn love was born. Pour 2 Tbsp. of batter onto greased pan or griddle. When bubbles appear on top of pancake, flip to other side. Repeat until there is no remaining batter. *Notes: You can substitute the sucanat for brown sugar. You may also use the oil of your choice, but I highly recommend the coconut oil for the flavor. You can use either canned pumpkin or homemade pumpkin puree. I used King Arthur Gluten Free Multi-Purpose Flour in this recipe. This is hands down my favorite gluten free all purpose flour that I have tried since our oldest son was diagnosed with celiac disease. This recipe fed our family of 6 and we had leftovers. My kids love pancakes as a snack, so this was great. I’ll try freezing the leftovers some time too. I’ll probably try these without sugar next time. 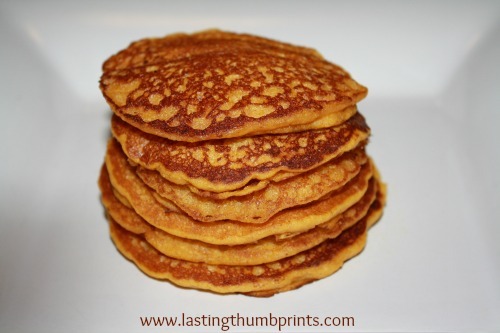 These pancakes will definitely be on our menu a lot this fall and winter! We really like banana & chocolate chip pancakes too. What’s your favorite kind of pancake?